As I peered through the blinds early on Sunday morning the grey sky and cool light southeaster breeze hinted that it was shaping up to be a good day to go a car show. With a number of events to choose from I opted for the easiest – the closest one. 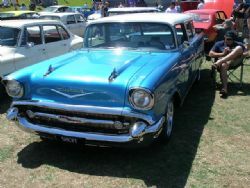 That turned out to be the Northern Beaches Car and Bike Fest at Rat Park in Warriewood. The event was open to all bikes, rods, customs, classics, muscle cars and interesting vehicles with trophies on offer, raffles and lucky door prizes being called out over the PA on a regular basis. I stumped up the $5 entry fee after seeing a good collection of vehicles inside the fence and with proceeds going to Heartkids it was a worthy cause. Straight in the gate and the classic Kombi serving frothy coffee had my immediate attention so with cup in hand I wandered aimlessly for a few hours checking out the eye candy. Heaps of bikes, tons of muscle cars, vintage, classics and a few sleeper Japanese classics thrown in the mix as well. There was a good vibe inside and lots of lookers, which may have been aided by an article in the Manly Daily letting the locals know it was on. Trophies were all people’s choice with everyone given a pencil and voting form and there were a number of categories – Australian muscle, American muscle, Japanese, light commercial, hot rod, bike, vintage and classic. All categories were well represented with an array of pristine show cars through to rat and unrestored bikes and vehicles. There was a standout pair of Aussie panel vans by the oval fence, one an EH, the other a HR Holden. 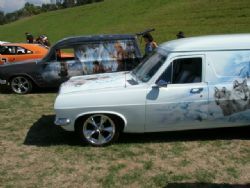 Both had elaborate paint jobs with extensive airbrushing, trick leather interiors and the full mega sound systems. Took me back to my youth although my panel vans were more tradie like than these show stoppers. 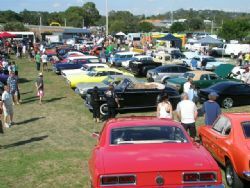 Northern Beaches Hot Rod Club had a number of their members and cars in attendance along with a number of wild rods at the far side of the grounds. 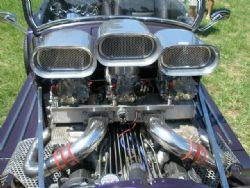 A 28 with a trio of carbs and a custom manifold looked like it could pull the tar off the road and there were numerous American muscle cars to delight MOPAR, FoMoCo or GM enthusiasts. Standing on the hill looking down at the front paddock I spot a 57 Nomad that looks very similar to the one I have been building for too many years. I had a long chat to Marty who owns it and subsequently gave it my nod for the American muscle category as it was up there with the best of them. With afternoon commitments I was done and dusted by 1pm so I wasn’t around to see who took home the trophies but I reckon I could guess at least half of them. On the bike front it would be very difficult as there were so many and the quality was high with retro bobbers, rat bikes, lots of Harleys through to fully tricked out custom choppers. This is an annual show and it exceeded my expectations. I’ll be back next year, hopefully with a restored Nomad to show.